MANY PARTS OF the country have experienced rain in recent days, after a prolonged dry spell. There’ll be more rain in the coming days but the forecast is looking better for next weekend. Met Éireann has said that most areas will be dry for the rest of today, with just a few isolated showers. Maximum temperatures will range from 15 to 19 degrees Celsius. Outbreaks of showery rain will develop in western coastal areas later this evening and early tonight. It’s expected to be mostly dry over the eastern half of the country tonight. 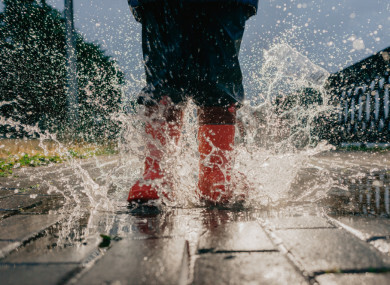 Outbreaks of showery rain will become widespread across Connacht, much of Ulster, west Munster and over southern and southeastern coastal areas, with some heavy bursts in parts of the west. Rain will be more patchy elsewhere. Minimum temperatures will range from nine to 13 degrees. Tomorrow morning rain in the southeast will clear and many areas will be dry, with bright or sunny spells. However, scattered showers in Atlantic coastal counties in the morning will extend gradually eastwards during the afternoon and early evening, some of them heavy, with a risk of thunder. Maximum temperatures will range from 15 to 19 degrees. Monday night showers will continue in the west and north and later in the night cloud will increase from the west with showers merging possibly into longer spells of rain. Lowest temperatures will stay at around 9 to 12 degrees. The weather is expected to be unsettled with showers for the next few days but then high pressure is likely to build again, with mainly dry weather for the weekend and temperatures in the high teen to low 20s. From Friday onwards high pressure is likely to build over Ireland and it will be mostly dry with just the odd shower. Email “More rain on the way, but things are looking up for next weekend”. Feedback on “More rain on the way, but things are looking up for next weekend”.